Born in Versailles in 1857, Leon Girardet received his formal training under the great Academic artist Alexandre Cabanel. It was from his studies with Cabanel, that Girardet honed his abilities to become a great figurative artist – working in both oils and watercolors. Girardet’s highlife genre paintings are filled with light and color. The figures are adorned in clothing made of rich satins and silks, which shimmer and shine as the sunlight illuminates their deep jewel tones. They are often captured in conversation and, whether lovers or just friends, appear to be enjoying their time together. 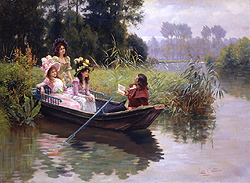 Girardet was a member of the Société des Artists Français and a member of the Société des Amis des Arts and exhibited at the Paris Salon during his lifetime.